When it comes right down to it everyone’s appetite amounts to about the same thing. Greed, lust, wrath, envy --it all stems from the same grisly desire: blood. 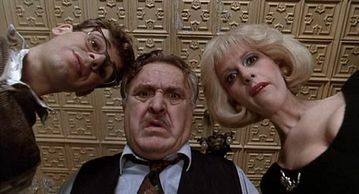 No film, I think, actually personifies that carnal hunger quite like 1986’s Little Shop of Horrors. It’s a film that explores the depths to which humans will sink to get what they want. To tell you the truth, when I approached writing this blog I started to bore myself to death by attempting to write an in-depth synopsis of the film. In fact, the only thing that I got out of it was a headache and an unexplainable desire to chew flesh. 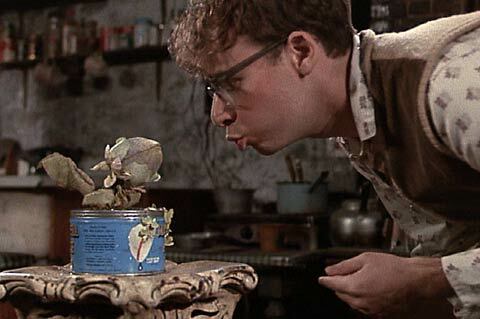 But in all seriousness, there’s something particularly unsettling about Little Shop that goes far beyond the ridiculous notion of a carnivorous Venus flytrap from outer space attempting to consume the planet Earth. It’s the unsettling realization that the desperation of a people could drive them to depend on the carnal cravings of a talking plant. Imagine Skid Row --a place of dire destitution that not even the most wretched of wretches could conceive of as a home. This is the setting for a frightening frolic into the minds of a few hungry souls roaming the streets. Though it’s meant as a dark comedy that pokes fun at the overindulgence of consumerism, it’s also an allegory that peels back the layers of the human psyche, giving the audience a first person perspective of the scraps of humanity that bind us. Of course, the dramatic circumstances of utter poverty and hopelessness that paints the background of the film only serves to give the audience an up close and personal look into the tragedy that belies our own existence. The message is obvious --if we allow our own hunger (meaning lust, meaning greed) to be our driving force, then the only logical step is a cannibalistic need to devour anyone that blocks our path to success. It’s this disturbing need for self-fulfilment that leads Seymour Krelbourn (our hapless in love protagonist) to feed the demon plant’s insatiable appetite for human blood by chopping up the abusive boyfriend of his love interest, Audrey. It’s this drive that allows Mr. Mushnik, the owner of the flower shop where the blood hungry flytrap was born, to blackmail and, essentially, corrupt the innocent. Everyone feels justified in what they’ve done --after all, Audrey’s boyfriend beat her for his own sexual escalation and Mr. Mushnik was only trying to salvage the one speck of beauty left in the beat down existence he lived in Skid Row. When we put our own sordid minds to it, we can twist the disgusting to be the completely logical. As humans, our appetite is essentially fed on our own egos. We allow what we believe to be most self-beneficial to completely overrun our senses and bend us into grotesque figures that we so easily balk at in the daylight. Audrey II (the name of our flesh-eating vegetable) only represents human nature --he eats other humans to help himself grow, to eventually take over the planet and stake a claim for his species. Is that not what humanity is at its core? Those times of survival that the inhabitants of Skid Row lived daily, give rise to level of desperation in which that which gives even a glimmer of hope is heightened and taken to a place that many would fear. I’d say in terms of the true symbol of food, Little Shop of Horrors is a smorgasbord of irony, metaphor, and human insight.